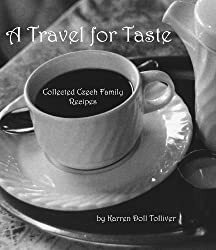 REMEMBER: Even when it’s not a holiday season, you can always buy all my books on Amazon.com, including ATFT cookbooks and photography books. They make great gifts! I notice that Amazon frequently discounts my books (fortunately I don’t take a royalty hit when they do), so check for bargains often! 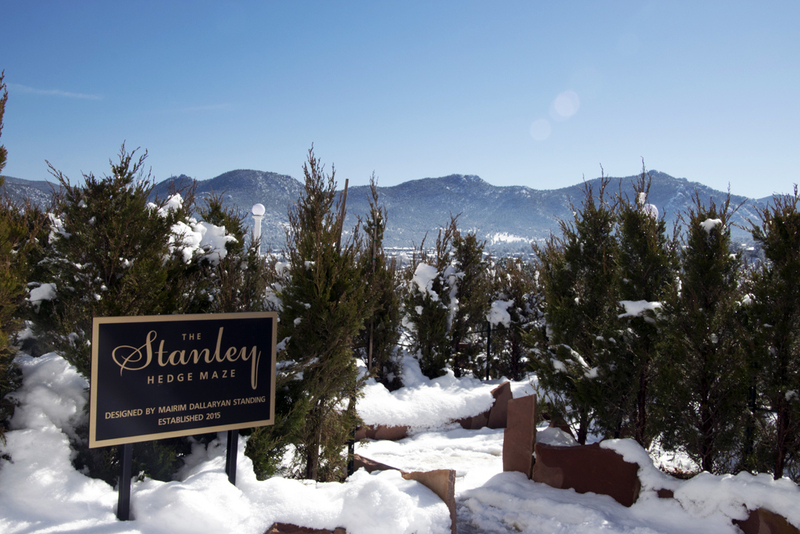 A few weeks ago I posted a blog about the Stanley Hotel in Estes Park, CO. Consider this post Part 2 of that one. 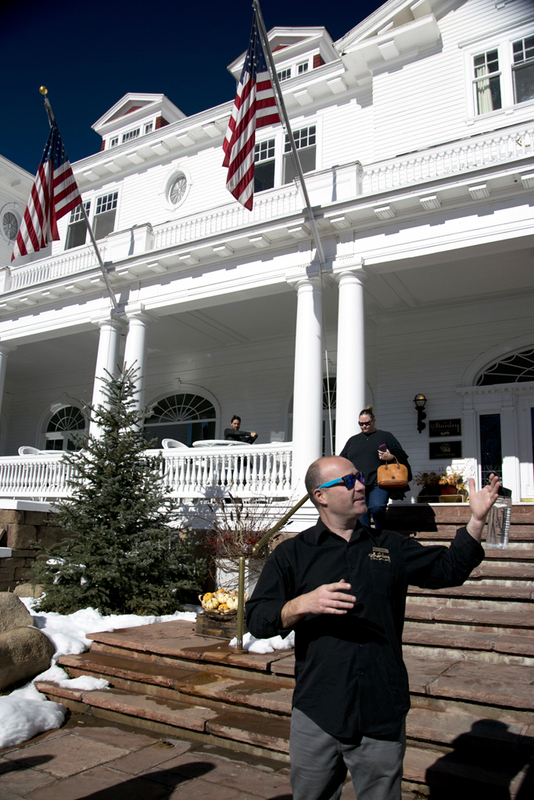 I’ve now visited the Stanley Hotel three times. The pictures in the previous post were taken on my first visit last June. The pictures you see here were taken last November – I don’t know about you, but these snow pix REALLY take the cake! 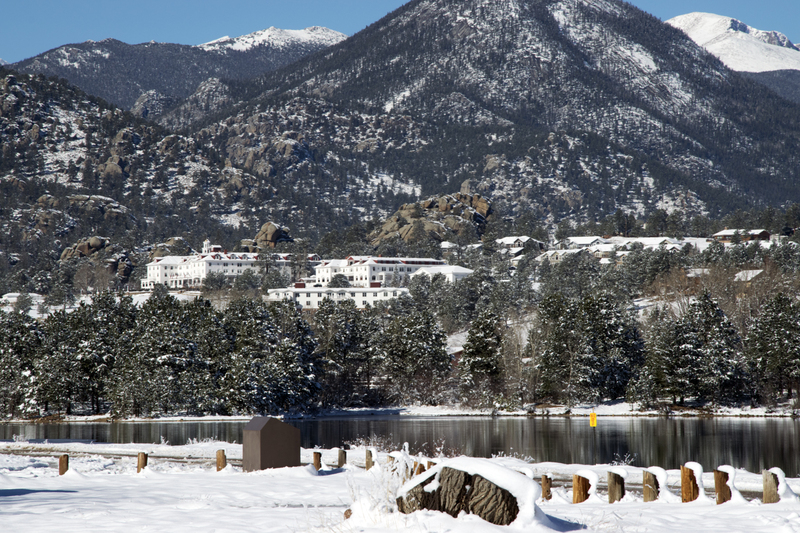 I took that shot at Lake Estes, just below the hotel in the valley. 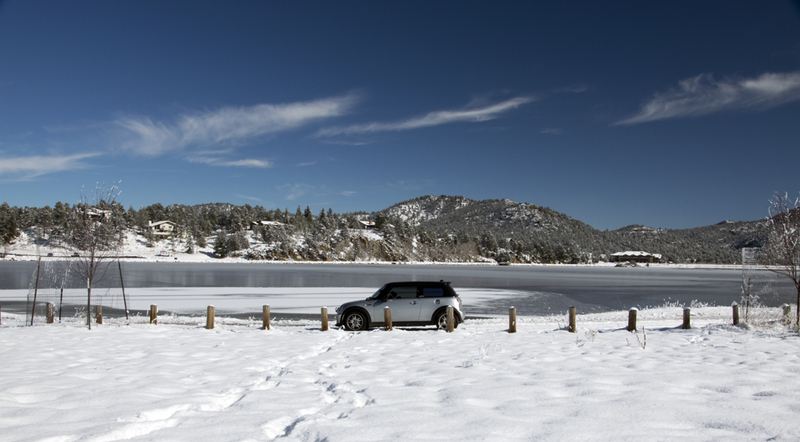 It looks like my car is on the ice, but it really wasn’t. However, you can get a feeling for what the mountain snows do for the landscapes up there. 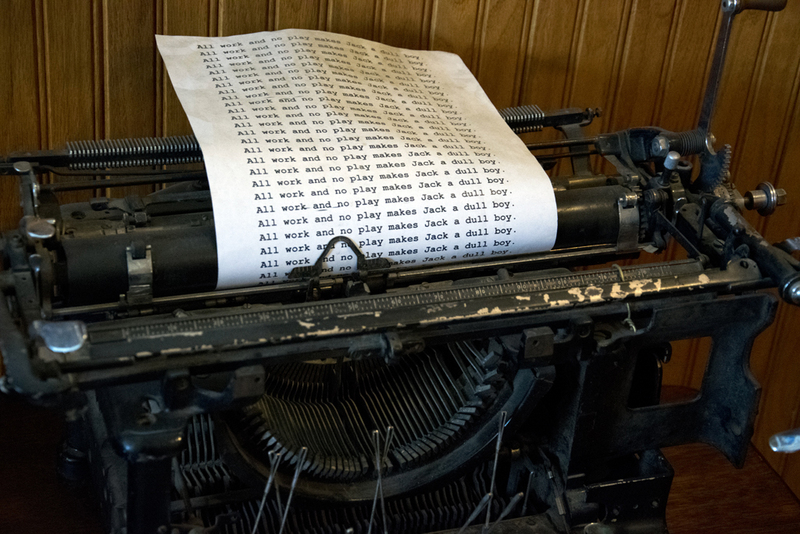 It’s a reference to The Shining, where Jack Nicholson’s character types that sentence over and over on enough pages to make a whole book manuscript. Nice touch. 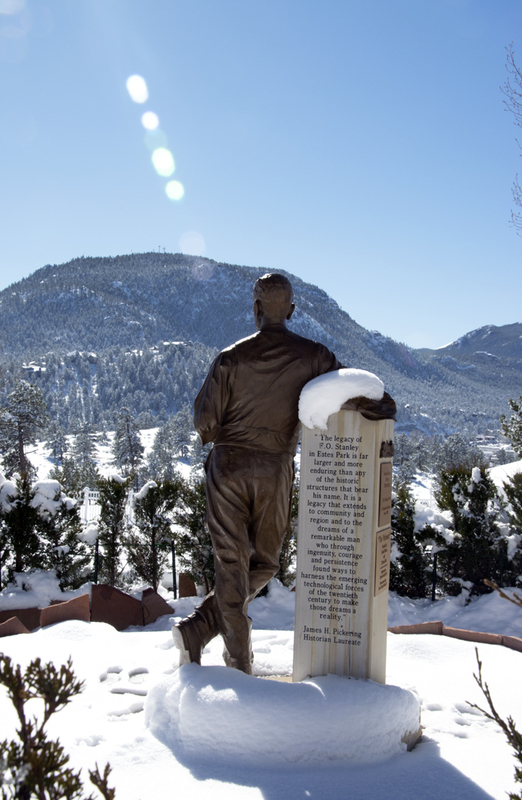 You can see how, though there is snow on the ground, the Colorado sun really warms you up. We were all in shirtsleeves and feeling over-toasty in the sun. Just don’t duck into the shade! 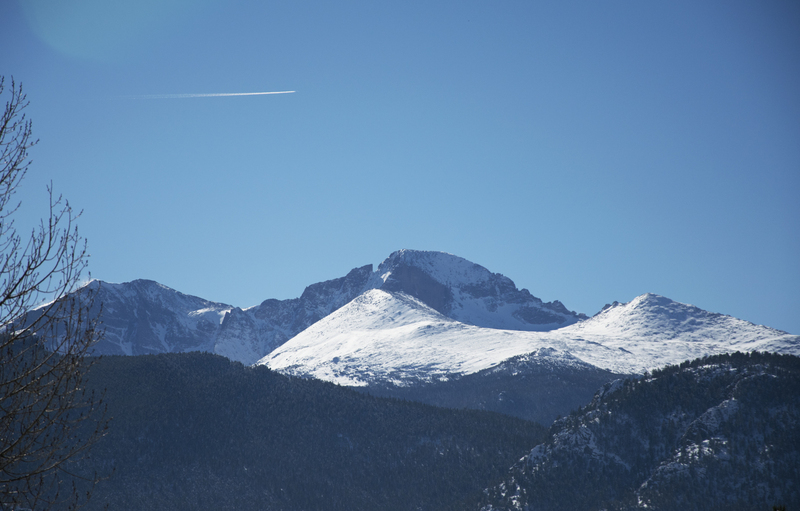 Just to the right of that photo, you can see the famous Long’s Peak, which is the highest mountain in the Front Range of the Rockies in North America. At 14,259 feet (a fourteener, as they call it), it’s a landmark I can even see from my apartment window in the Denver-suburb flatlands. Guide-guy (sorry, don’t remember his name) pointed out the “beaver” to the left of Long’s Peak’s summit. You can see a rock formation there that looks like the profile of a beaver sniffing the peak. Long’s Beaver? 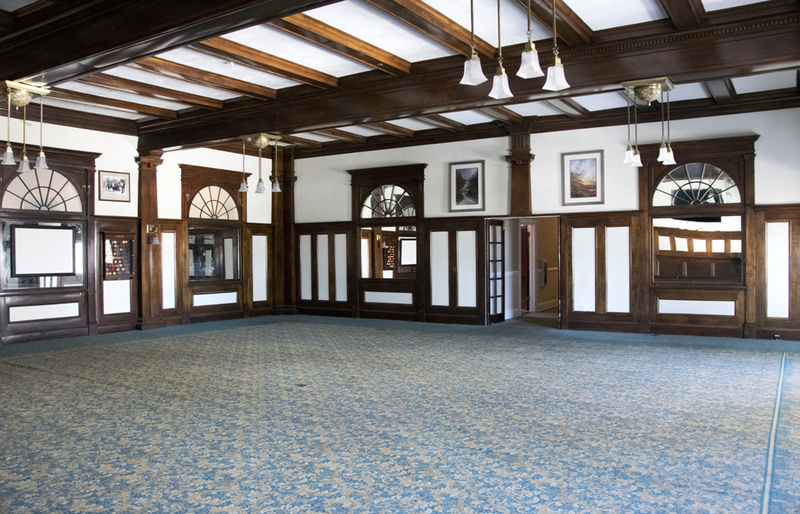 In the lobby of the main building is a great-looking old mirror – love that frame! And the piano below it has an odd shape, as do many other pianos in the hotel. They were built in that shape so they could more easily fit in covered wagons on their way out West back in the day. 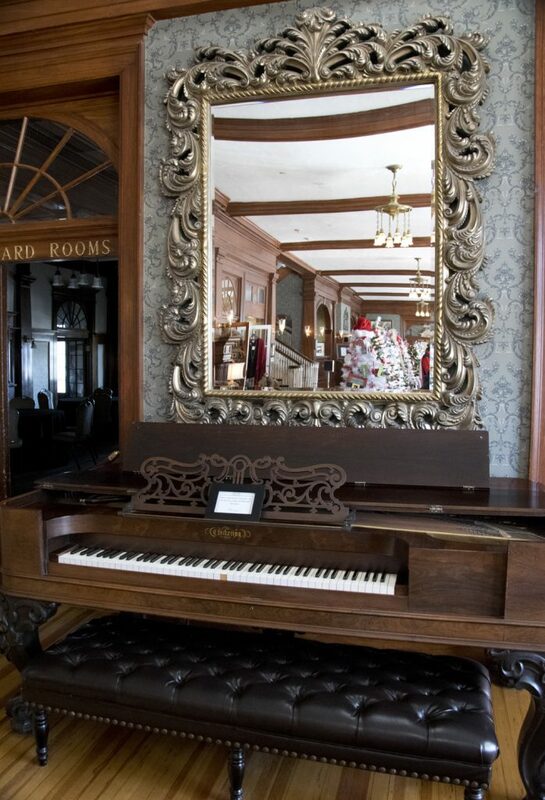 Just to the left of that piano is the Billiard Rooms – yep, two rooms for billiards. The guide told us the floor under the carpet was cork so that the (used to be) ivory billiard balls wouldn’t shatter when they hit the floor. 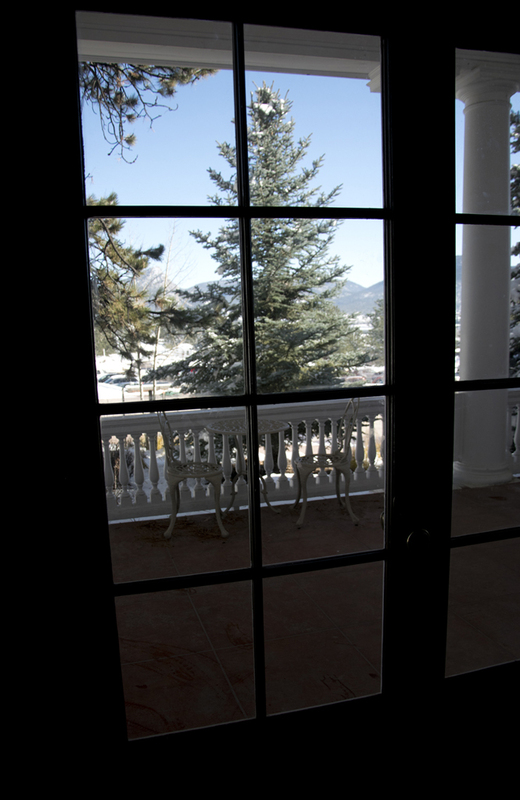 Here’s a shot from inside that room looking out one of the several French doors. Love that veranda! 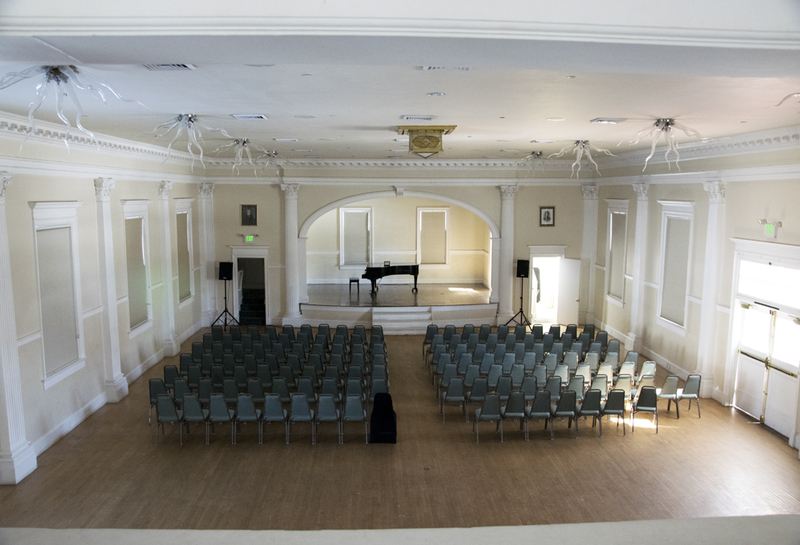 Our guide took us to the concert hall, a separate building from the Stanley main buildings. It hosts many, many live concerts there, including Mary Chapin Carpenter and Rick Springfield last year. We learned lots of architectural info, including the lighting fixtures. Note: the glass fixtures are NOT Chihuly! 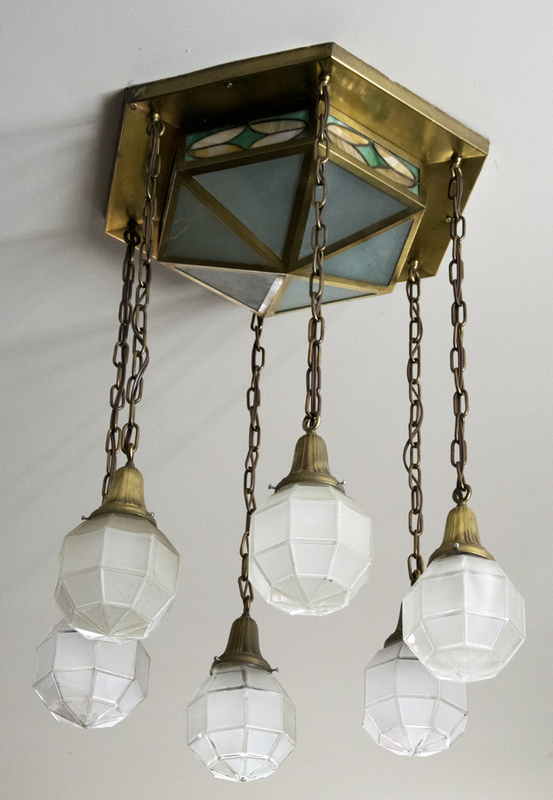 The brass/glass one in the middle matches fixtures in other buildings, too. 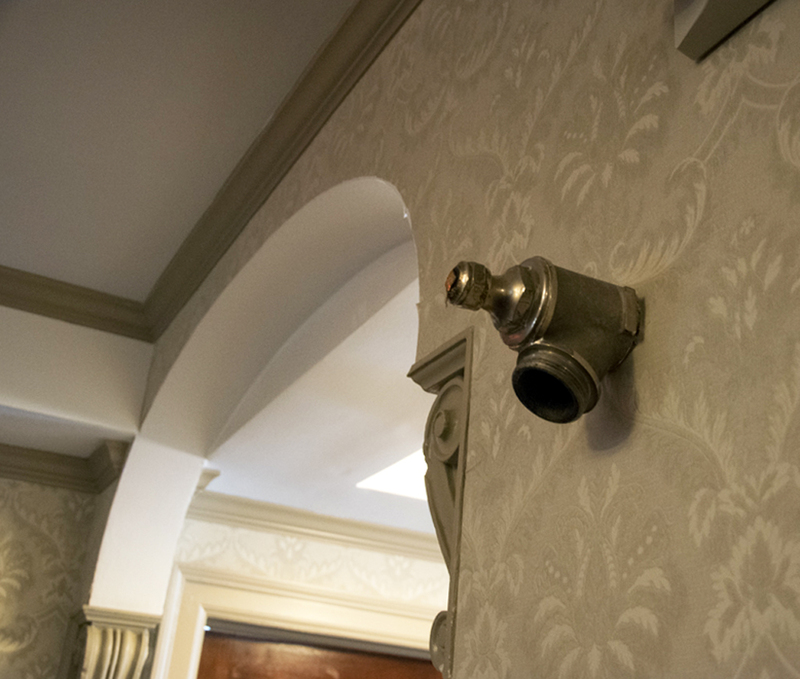 The going theory is that King used that for the inspiration of the scene in his book where the little boy is being chased down the hall by demon-possessed fire hoses. That scene didn’t make it into the movie. I trudged all the way up to the fourth floor, which was no easy feat because of the high mountain elevation and very warm day. 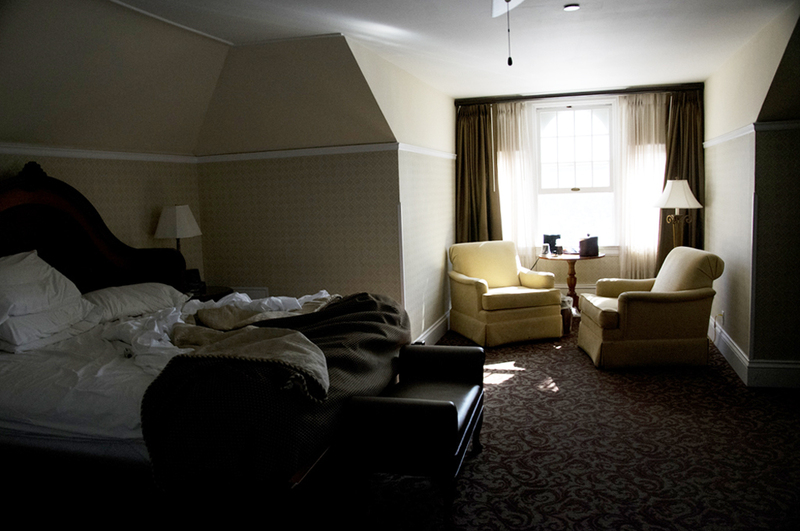 I went up there to photograph Room 401, which is one of the more haunted rooms. 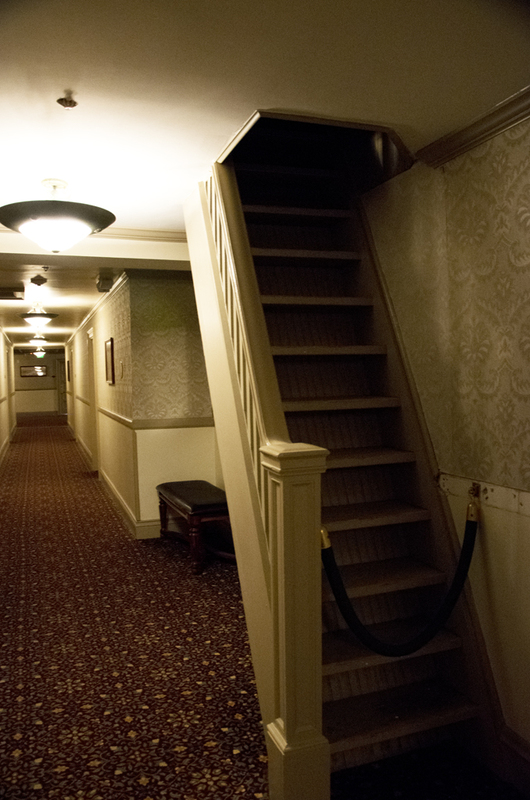 In fact, the whole fourth floor is said to be the most-haunted floor. 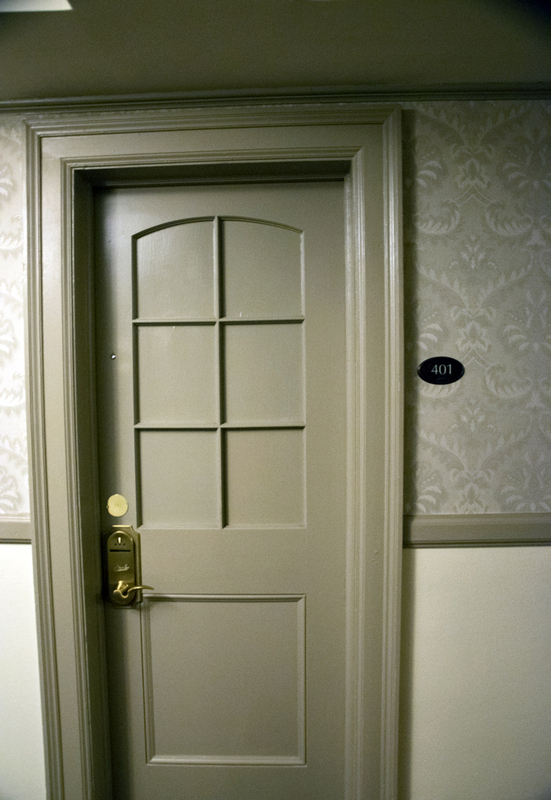 The guide told us they had to replace the door of 401 and add a second, inner door because people kept stealing the room number plaque and vandalizing the door. But maybe it was the ghosts??? 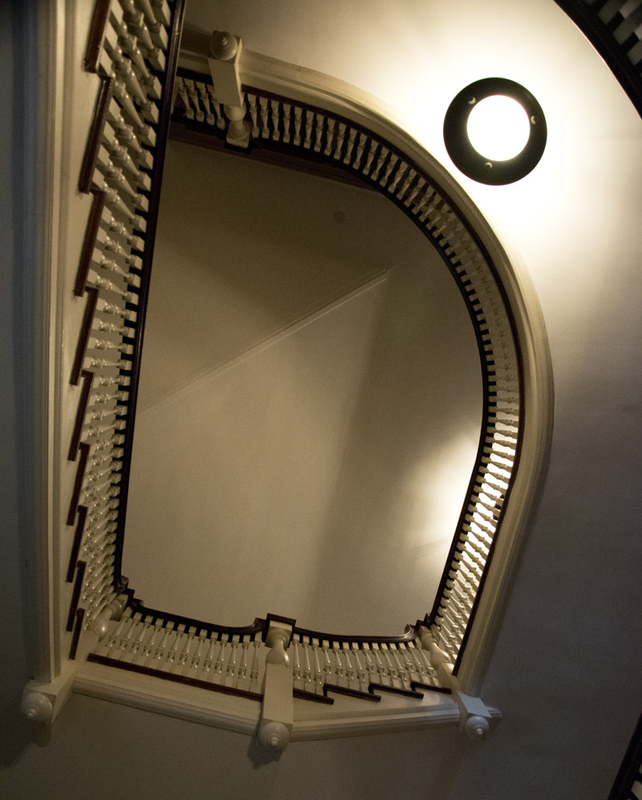 Being up there – and I was alone – was the only time I felt a little creeped out. Just opposite Room 401 is a stairwell leading to a bell tower, which was chiming the hour when I arrived. Maybe the sudden silence after the bells stopped made it more eerie than normal? Or it was ghosts! By the way, you can buy novelty room keys in the hotel gift shop for rooms 213 and 401. I’m kind of surprised I don’t have them yet! 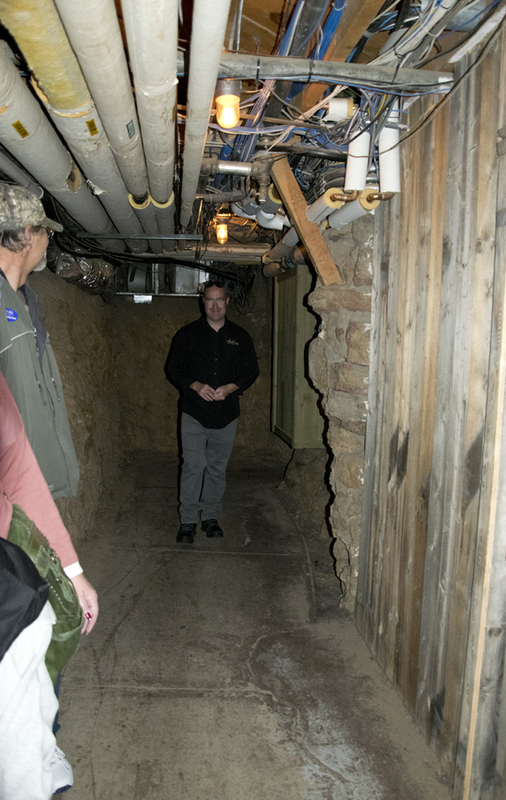 Our tour ended in the basement under the hotel, which is (or was) used as a servants’ passage to other buildings. You can see the quartz in the rocks that the hotel is built on down there. For some odd reason, the guide did a big build-up to turning off the lights for a few seconds, which he did. I’m still not sure why that was a thing, but it was certainly pitch black. This after telling us that there may be a ghost or two breathing on your neck down there. Yikes. The tour lasted about an hour and a half. It was nice, but not spectacular. If you’re interested in seeing doors of famous rooms, hearing reports of ghosts, learning about Steven King’s stay and those of other celebrities, and being in a dark basement, then I’d recommend it. I enjoyed seeing the architecture and hearing the tales. However, there isn’t much you couldn’t just walk around and see on your own (except maybe the basement part). They do have a ghost-specific tour at night as well. I’ll be honest, I checked all my photos of the place carefully when I arrived home, half-hoping to see ghosts, or at least orbs (don’t get me started about my opinion regarding orbs in photos! ), but I got nada. Sigh. 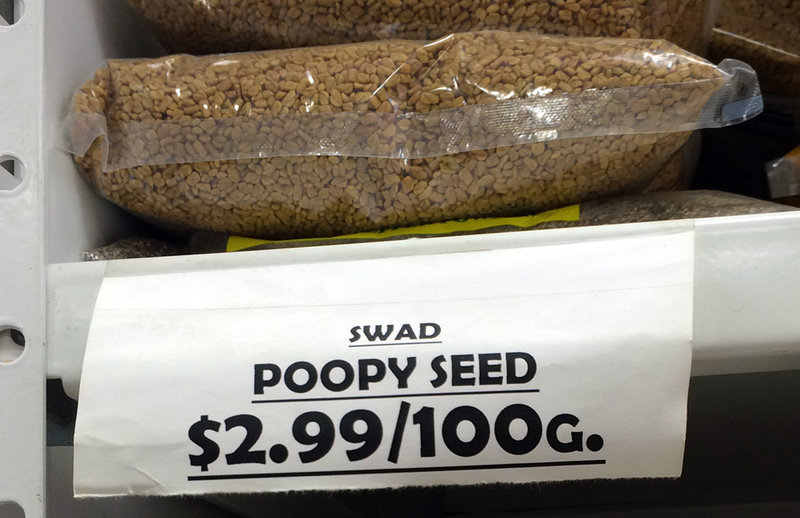 Am I too skeptical? Anyway, I’m happy to have experienced the tour, but I think once is enough. Next time, though, I’m buying those novelty room keys in the gift shop! Au contraire. Mr. Guide Guy misinformed you. Square Grand Pianos were not built to fit into covered wagons but since they fit there so nicely that is most likely the reason so many were brought with our pioneers on their westward treks. Square Grand Pianos have an interesting evolution. And I loved the non-Chihuly light fixtures — did Mr. GG offer any history of them? Thanks, Joan! I thought the “fact” didn’t quite ring true, especially since Mr. Guide Guy said a few other questionable things. No info about the light fixtures, though, except he told us they were definitely NOT Chihuly. I’ve emailed the hotel, asking for more information. Stay tuned….